Greg Pantaleoni, Director, Effective Systems Solutions Pty. Ltd. This is the first book to seriously tackle the subject of bringing Asset Management into line with other areas of corporate activity. Through a unique adaptation of the balanced scorecard approach to asset management, it provides a structured approach for both the development of strategy and its implementation. Additionally, readers will find a catalogue of indicators along with their uses and weaknesses, a definitive guide to measuring the success of RCM programs, and a logical format that leads them from start to finish with information and hints on each phase of the maintenance scorecard approach. If you or your company need to manage physical assets, you need this book! • Provides the RCM Scorecard, which is unique to this book and has not been done previously to this level of detail. 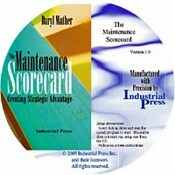 • Includes information and hints on each phase of the maintenance scorecard approach. • Focuses at length on the creation of strategy for asset management and details the differences between various industry types, sectors and markets. • Offers an introduction to the methodology of Problem Elimination Logic, and its application and use in the industry. • Contains a brief overview of the Technical Change Management System a method for increasing the effectiveness of capital spending in maintenance. • Provides a guide to some of the true uses and limitations of benchmarking as a strategic tool for improvement. • Uses many illustrations throughout to explain and underline the concepts being presented.